Update: Windows 10 PC Build 14971 released. More details below..
Get Office (Beta): Get Office version 2.0 for Insiders in the Fast ring released. (version 17.7614.2377.0). Whereas before Get Office was largely a collection of links to help you get started with Office, the new and improved app will help you explore and manage your Office experience. Original Story: Windows insider team now working on Windows 10 Creators Update Build 14971. 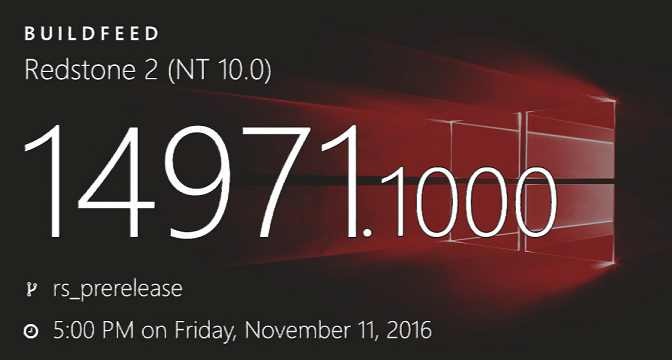 Redstone 2 PC build 14971.1000 and mobile build 10.0.14971.1000 were compiled on November 11, 2016. Microsoft could also release a new build for slow ring insiders.